A residency project begins as a research idea, usually before the residency year even begins, and undergoes a rigorous process of development and refinement to come to fruition. The anticipated path for a residency project is depicted above and described below. Review process is time-consuming and beyond the control of the resident and preceptors. Residents are encouraged to allow for up to 8 weeks for this process. 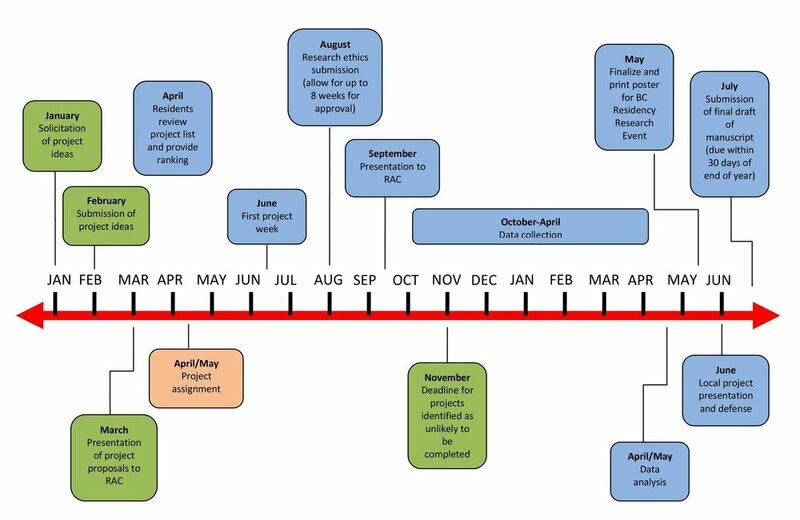 By this date, project preceptors should identify projects which are not likely to be completed in the residency year. Pending a review to determine the cause of the delay, the student may be asked to identify a new project. There should be firm plans to begin data collection at this time. Pharmacy residents are strongly encouraged to submit their projects for the provincial Pharmacy Practice Residency Award. Information on award submissions can be found at the CSHP-BC Branch website (http://www.cshp-bc.com/).